We did it and we're happy how everything worked out. Thanks everyone who helped us! Now, go visit Design Museum and check the exhibition on the 1st floor. It's on Korkeavuorenkatu 23, Helsinki. The exhibiton is open until September 19th. We also had a great VIP-party at A21 on August 24th. It was wonderful to see so many people in our party and thanks for celebrating with us! The following day, August 25th, we had Press Event at Hotel Klaus K. Again, thanks to all participants and we hope everyone enjoyed the event as much as we did. It was special to see so many Finnish designer's fashion being represented that day on the catwalk. We have a lot of pictures of these events in our Facebook, check it out! Through the interpretation of Daniela Talvitie, a Brazilian fashion photographer, Fashion Photo Helsinki presents the audience with the hottest Finnish Fashion. By mixing fashion with familiar urban spaces, the exhibition creates new world views in presenting top Finnish designers. 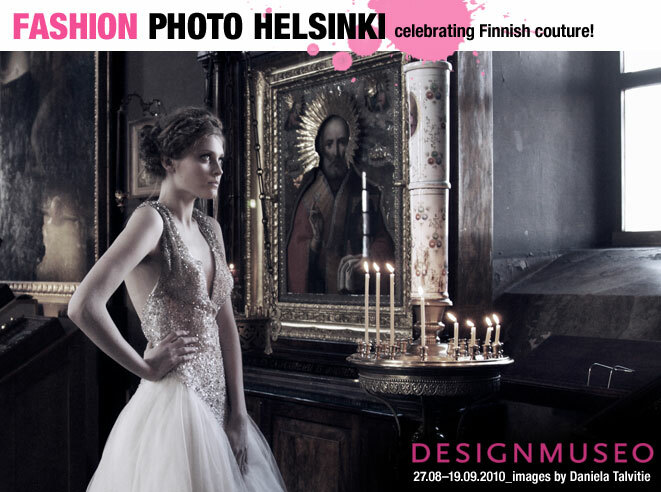 The Fashion Photo Helsinki will premiere within the distinguished walls of the Design Museum during the Helsinki Night of the Arts on August 27th, 2010. Daniela Talvitie, the fashion photographer, arrived in Finland from Brazil in pursuit of her love in 2003. Working in the Brazilian fashion industry, she has gained experience and a certain vision that she skillfully uses in her fashion shoots. Her great admiration for Finnish design and architecture has brought her to the realization that Finnish fashion deserves more recognition. In addition to the Fashion Photo Helsinki Exhibition, Daniela’s time is filled with mothering two lively boys.